Her portraits of contemporary artists and intellectuals and her take on transformations in the city of New York constitute an exceptional portrayal of modernity during the first half of the 20th century. Until the 19 of May, at the Fundación MAPFRE Casa Garriga Nogués Exhibition Hall. Fundación MAPFRE opened today, 19 October, in Barcelona, the exhibition Berenice Abbott. Portraits of Modernity, which provides a thorough review of the career of this American photographer. Her work, which is among the most captivating to come out of North Amercican photography in the first half of the 20th century, bridged the gap between the avant-garde of the old continent and the burgeoning artistic scene on the East Coast of the United States in the 1920s and 1930s. Berenice Abbott (Springfield, Ohio, 1898-Monson, Maine, 1991) started her university studies with the ambition of becoming a journalist. In 1918, she moved to New York and settled in Greenwich Village, a stimulating milieu for artists and intellectuals that paved the way for her first contact with creatives such as Marcel Duchamp. At that point, she began to produce work as a sculptor. Three years later she traveled to Europe and settled in Paris where she began work as an assistant in the studio of Man Ray and discovered her true vocation: photography. In the mid-1920s, Abbott met Eugène Atget and was impressed by his work; right from the very start, the qualities we see in her own work are inspired by the deep respect in which she held the French photographer, something that gave her a reference point around which to develop her own aspirations in the world of photography. After Atget’s death, Abbott bought his entire personal collection. Her work was featured in a retrospective exhibition in 1970 at The Museum of Modern Art (MoMA) in New York and in 1983 she became the first female photographer to be admitted into the American Academy of Arts and Letters. In 1988 the French government bestowed on her the title of Officier des Arts et Lettres and she also received the Master of Photography award, granted by the New York International Center of Photography. The concept of modernity permeates all of Abbott’s work, from her portraits of the most avant-garde artists and intellectuals of the day through to her scientific photos (in which she captures the results of various phenomena and experiments) by way of her breathtaking views of New York City. It is a concept which, in turn, reflects the modernity of the artist herself, with her avant-garde and audacious character that encouraged her to be open about her sexuality, living for over thirty years with her partner, the art critic Elizabeth McCausland. The exhibition, structured into three themed sections, covers her career using almost two hundred period photographs. Additionally, her work is counterpointed with eleven photographs by Eugène Atget developed by Abbott herself at the end of the 1950s. The visit begins with the Portraits section which feature some of the most ground-breaking personalities of the time. It mainly portrays the lives of the group she formed part of: the “new women” who were willing to flout conventions to safeguard their freedom. One example of these portraits is the one of Janet Flanner on Paris. 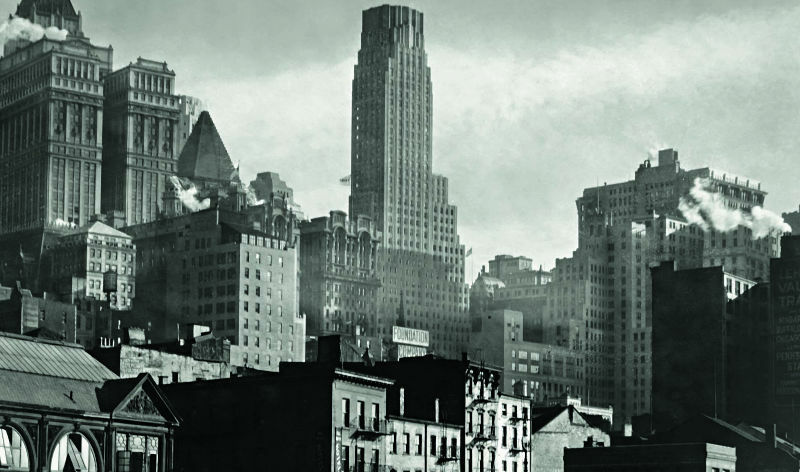 The second group of photos, Cities, brings together the dazzling portrayal by Abbott of 1930s New York. Her lens turns New York into a living being that reveals its extraordinary personality to visitors through its skyscrapers, bustling crowds and storefront windows. She carried out this project independently until, in 1935, she was able to finance it with a grant from the Federal Art Project. These images were published in 1939 under the title Changing New York, to critical acclaim and bumper sales. The last part of the exhibition concentrates on her photographs of experiments and scientific phenomena. Abbott began working on them at the end of the 1950s when she became a member of the Physical Science Study Committee of the Massachusetts Institute of Technology. These photos once again clearly demonstrate the recurring duality of Abbott’s work. They are images that document scientific phenomena but at the same time reveal the exquisite imagination and creativity of the photographer. Attending the launch of the exhibition was its curator, Estrella de Diego, professor of Contemporary Art at the Complutense University of Madrid and member of the San Fernando Royal Academy of Fine Arts, and Nadia Arroyo, director of the Culture area of Fundación MAPFRE. To coincide with the exhibition, several activities are scheduled in collaboration with two prestigious Catalan cultural institutions. The Filmoteca de Catalunya has programed a screening of the documentary Berenice Abbott: A View of the 20th Century. This will be shown on 20 February with an introduction given by Carlos Gollonet and, on 1 March, by Estrella de Diego. Also, the Institute of Photographic Studies of Catalonia will, on 21 February, launch the collective exhibition About Abbott, comprising photographs taken by students from the IEFC, from Goldsmiths, University of London, from the University of East Anglia and from Kingston University; who were all asked to produce an interpretation, adaptation or deconstruction of the Berenice Abbott photograph entitled Aerial view of New York at Night, taken on 20 March 1936.